You may have noticed I haven’t posted in a little while. I would like to apologize but also admit to you that I do not always prioritize my little blog: after working (and I was traveling for work a great deal in January, consuming an exorbitant amount of my time), I also like to sleep, and get outside, move my body, and yes, cook. I do sometimes cook things without telling you, or even Instagram (although it is much easier to snap a photo and post than write a whole recipe out, so that does happen more frequently). I did have a lovely little sojourn in the city of my birth, San Francisco, where you can follow my food-biking tour around the city via Instagram. Here’s how it went: bike—Tartine (best chocolate croissant I’ve ever had)—bike—Ferry building farmers’ market—walk-Chinatown (bought tea)—walk—Rancho Gordo lunch at Ferry building, and coveting everything else—bike—Pier 39 and sea lions—bike/walk (too much hill to straight bike)—Lombard Street—bike—Ghiradelli sundae + break for digestion—bike—Chrissy Field beach relaxation—bike—Golden Gate Bridge—bike through Presidio—bike through Haight-Ashbury—tea break—bike through the Castro—bike home. Next day: Tartine round two, and a Mission burrito to take on the airplane. Not bad for a quick trip! However, all that adventure aside, I am now home, and glad to be getting back into routine. I don’t promise to always post consistently, because I never know how life will go, but know that you are still important to me. Perhaps we can relax together. It is time to take a breath. You may then feel inclined to hold it for a moment, however, afraid to mess up what is breathing itself in the oven (soufflé is French for breath). Don’t worry, ovens are not as finicky as they used to be. Soufflés are not terribly difficult (although it helps to know a little French for reading about the components) but they are still exciting. I found myself warning my roommates not to yell too loudly, or open the oven before it was time. A classic soufflé is just some very good cheese in the base; but you can add puréed anything (leeks? caramelized onions? spinach?) for added flavor. What I like about soufflés: they are showy, vegetarian main courses, good for brunch or dinner, don’t take too many fancy ingredients, are light, soft, and luscious, and present the magical powers of eggs quite magnificently. If you haven’t already, roast, cool, and purée the squash (can be refrigerated at this point or before puréeing if you like). Butter a soufflé dish, or large straight-sided dish of some kind (or ramekins/small dishes if you’d like to do individual ones). If you want, sprinkle a little grated cheese in to stick to the sides. Preheat oven to 400ºF. Make the béchamel (white sauce): Heat up the milk (I usually use the microwave, but a stove works too), warm but not boiling. Make the roux (equal parts fat and flour, the thickener): melt butter over medium heat in a medium pan, gradually sprinkling in flour and whisking to form a paste. Gradually pour in the hot milk, whisking, and continue heating (and whisking) until thickened. Turn off heat and stir in the seasonings. Let cool for a moment. Separate the eggs into two different bowls, the whites in a large mixing bowl (you can put the yolks right in with the puréed squash, if it isn’t hot—you don’t want to cook them prematurely). When the béchamel has cooled slightly, whisk in the yolks, squash, and cheese. It will be fairly thick. Whip the whites until they form soft peaks, but are still shiny. Fold about 1/4 of the whites into the yolk mixture to lighten it, then gently add it back to the rest of the whites folding it all together (gently!) until no obvious streaks remain. Pour into the baking dish and place in the oven. Turn oven down to 375ºF, and set your timer for 20 minutes. Don’t open the oven to look, since temperature variation can cause it to fall, but use your oven light (if you have one) to watch it puff up and brown on top. After 20 minutes (although it will probably take closer to 30, so try not to be too excited), you may open your oven briefly to check. It is done when it is all puffed, golden brown, and doesn’t jiggle anymore when delicately tapped. Remove, and serve immediately. It will fall as it sits, but remain delicious. 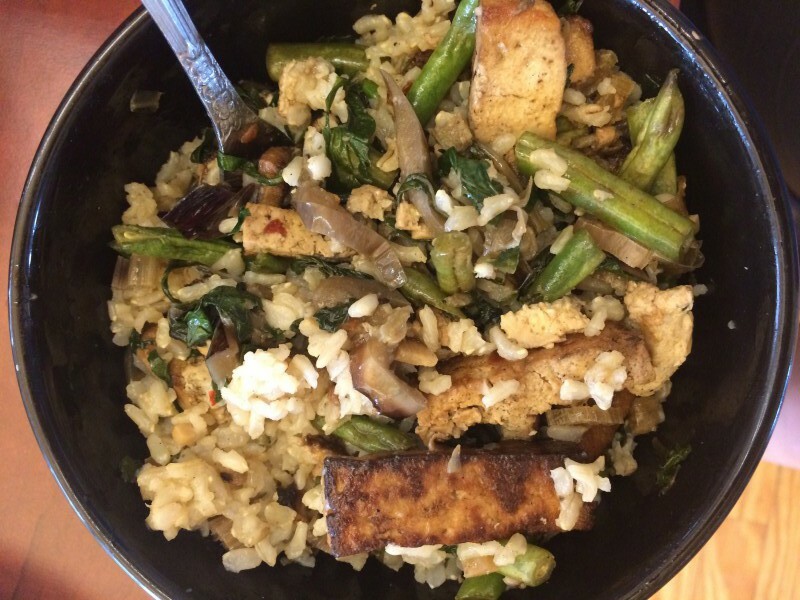 Friends, I have a new way to cook tofu that does not involve frying it (!). Don’t worry, I’m not going too crazy—it’s still tossed in soy sauce and put over high heat with some oil—but this time in the oven. Plus, after all that meat at Christmas in Montana (roast beef, smoked ham, scallops (brought by me from Maine), meatloaf with pork and emu, elk, venison, lamb…) I needed something a little more my usual style. Although I am intending to buy half a pig or something similar with Christmas money (thanks, grandparents!). It’s January (happy New Year! ), so you are officially allowed to begin using up the contents of your freezer. Which may include corn (straight from the cob to your freezer) and tomatoes. And, maybe your roommates are kind enough to get you a mushroom starter bucket for Christmas, so you have a fresh supply of oyster mushrooms. Handy. Year-end is habitually a time for reflection, resolution, and anticipation. True also in the food world. We’ve been imagining foods of the future for a while now, that still have yet to come to pass, like a food pill (sure, Soylent, you’re getting there). But maybe instead we’ll go back to our ancient roots and renew some old grains, like millet. At least we made some progress globally in 2015 regarding changing diets, and feeding the world… and we’ve got more changes, like more female farmers, to look forward to. And some food of our own, too. You can even pretend this is healthy (okay, it probably is healthy, depending on your health stipulations) and contributing to that New Years’ diet, too, if you want. Don’t give up deliciousness or you won’t stick to your goals! I did this with the broiler but I suspect it would be just as effective in a very hot oven, and possibly more efficient. I recommend cooking the tofu in a separate pan from the veggie mix because the tofu might otherwise absorb the excessive moisture produced by the tomatoes, diluting the soy flavor (and preventing crispiness, a real travesty). Cut up the tofu into 1/2 inch cubes. Sprinkle with soy sauce and oil in a shallow roasting pan, toss lightly, and put under the broiler. Broil for 10 or so minutes, flipping occasionally, until dark golden and crispy. Meanwhile, chop the tomatoes and mushrooms and toss with corn, a little more oil, balsamic, coconut oil, and salt. When tofu is done, or if there’s room, put in a shallow pan under the broiler and cook the same as the tofu, 10 or so minutes until golden, flipping occasionally. Taste and adjust salt and pepper. Toss the tofu with the veggies (lots of tossing we’re doing here), then crumble feta on top and sprinkle with cilantro. Lunch, breakfast, dinner. It matters not. Not for these. Something like a classic bagel topping, but lighter, greener, and a little cheesier. I adore leeks. And as it is now fall (you can feel it in the air and see it in the brilliant trees), they are quite available, and looking for attention. Let them shine on top of a simple cheese biscuit, with plenty of cream cheese. You may be interested to learn that my style of no-recipe teaching recipes is somewhat of a trend, as it happens. I think it’s a good one—after all, you can learn how to follow rules all day, but eventually shouldn’t you eventually know why they exist, and begin to create your own? (We should probably all go into policy, following that prescription.) It is indeed not about the recipe, but engaging you to think about food: the way certain vegetables lend their flavor to other parts of a dish, the composition that blends to create a whole mouthfeel. Yes, there are some ingredients that need to be exact—baking is particularly stickling (hence the detailed measurements below)—but more important are the ideas. The Internet is awash with recipes; I aim to offer you not only ingredients and methods but a conception of a meal, a menu, a combination, at the very least. If you ever have questions, let me know. Make biscuits: Preheat oven to 425ºF. Blend all biscuit ingredients except yogurt in food processor (or knife/pastry blender) until a sandy texture, with small nuggets of butter, similar to making pie crust. Stir in grated cheese without destroying the large grated chunks, then add yogurt and pulse; mix until almost forms a ball. Roll out on a floured board about 3/8 inch thick. Cut out circles (big or small, depending on the crowd and what you want—large size is better for topping with leeks) and place on baking sheet. Bake for 10 minutes or so, until golden on top. Remove from oven, take off baking sheet and let cool for a few minutes on a rack. Slice leeks lengthwise and clean. Sauté with butter and salt over medium-high until soft, shiny, and slightly caramelized. 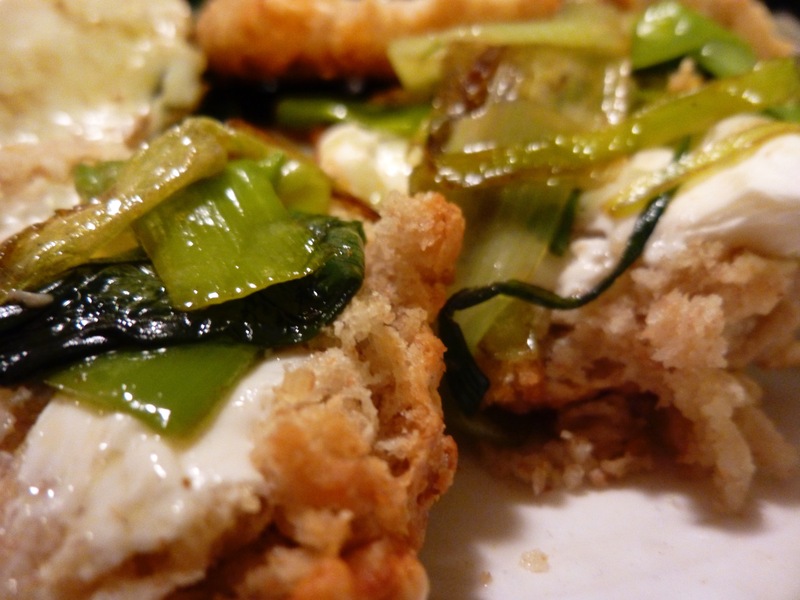 Cut biscuits in half, slather with cream cheese, and drape with leeks. Add a little fancy salt and pepper if you’re feeling decadent. If you want something heartier (again, lunch/breakfast/dinner, top with a fried egg, or some salmon (smoked or otherwise). Another weeknight, another stir fry. Sam Sifton of NYTimes Cooking recently re-pointed out his list of Asian essentials to make weeknight meals more easily delicious, and I am in utter agreement. Buying sesame oil, miso, and rice vinegar is well worth the initial investment. There are a few important components of a stir fry—although if you’re in a hurry and neglect one or the other, sometimes good quick food is better than the best food (not a philosophy I generally subscribe to, but no one likes being hangry, and the beauty of stir fries is that they can still be damn good)—how you chop the ingredients, the order you put everything in the pan, and the amount of seasoning. 1. Chop everything so it’s all the same size. I tend to like long rectangular pieces. 2. Cook on high or medium high (and keep watching and stirring! ), but make sure to put in the harder vegetables, and tofu, in the pan first. That way they can cook a bit before the flash-cooked ingredients, like green beans. 3. Season well! Add a variety of sauces, taste as you go, keep adding, let it cook down a bit, taste more, try something else… have fun! I’m sure this would be better in a wok, but I don’t have one so I shall continue to praise my lovely cast iron. An update re: life on Mars (thanks, Modern Farmer): apparently we should be able to grow crops there! But they’ll be missing some key nutrients that we may have to import, and could be lethal if we don’t rinse the soil. Wash your dirt and save your poop, kids. In keeping with the end of eggplant season, this particular stir fry (and another similar one the next week) made the vegetable a star, with a few chunks of crispy tofu and other veggies thrown in too. Add whatever veggies you want. I’ve been enjoying sweet potatoes recently, and onions of course, and something green like broccoli or beans or kale. Start by chopping all the ingredients, at least roughly the same size (carrots I cut in half lengthwise, then in slivers, so you get thin half-moons that will cook quickly). Peel the ginger and mince, along with the garlic (large pieces are fine). If you have time to marinate the tofu in soy sauce, do so. Heat up oil in the pan over medium-high heat until hot. Add tofu and a little soy sauce and fry for a few minutes on each side until slightly golden, flipping around a few times. Add the eggplant and sweet potatoes or carrots and cook for a few minutes, stirring often (you stir and it fries). At this point, start putting in a few other sauces, tasting, and adjusting. If you use miso, dissolve it in soy sauce or something else first, or you’ll get little potent chunks. Add the onions, ginger, and garlic and cook a little more, then the beans (I like my beans remaining nice and crisp). Taste and make final adjustments, then turn off the heat and add the scallions and any other last additions. Serve over rice. Or become full picking right from the pan. P.S. You can grow fruit on tiny tiny (bonsai) trees! Sounds like my dream. I have been fixated on eggplant of late. It doesn’t help that my roommate is also obsessed, so I’ve been buying it more frequently than I would otherwise. I used to not even like it at all—the texture, mostly—but like many childhood aversions, I am quite over it these days. Over the moon about it, actually (had to throw in a moon pun after yesterday’s activity). Although not everyone is, since it is one of the less nutritious of the vegetables. I suppose on top of an actual salad (well, I made it on a kale salad, so it’s full of good kale nourishment) makes it a double enemy for those seeking nutrition and fooling themselves by eating mostly water. However, it’s far better than chicken nuggets, or whatever else one might be eating, so I am quite content. Plus, eggplant. Delicious. 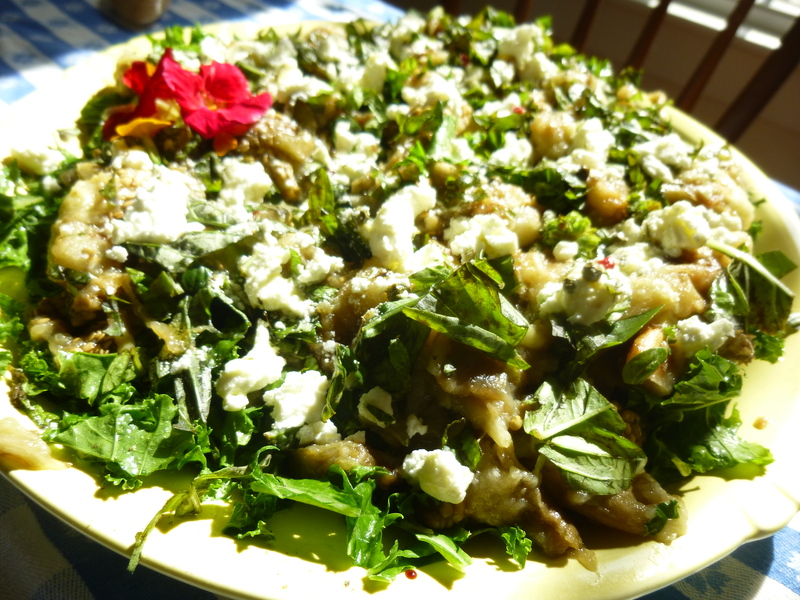 This is one version of eggplant salad. You could also prepare it similarly but top with an Asian dressing (say, miso, ginger, and rice vinegar, or fish sauce, garlic, brown sugar, and sesame oil) instead of balsamic, basil, and goat cheese. Something to try for next time (better make it quick, eggplant is on its way out). How long before we can grow food on Mars, now that we’re almost certain there’s water there? Sooner might be better than later—we are becoming dangerously war-torn here on Earth, to the point where seeds had to be extracted from Norway’s seed vault for the first time, due to the Syrian war (yikes), but, we should probably figure out our own problems before messing with another planet. Maybe the aliens will befriend us if we feed them eggplant. Cut the eggplant in half, prick vigorously with a fork (don’t stab yourself), and place cut side down on a baking sheet. Broil for 20 or so minutes, until the skin is blistered and the inside is very soft—an entered fork should meet no resistance. Remove and let cool. Meanwhile, wash and chop up the kale. Drizzle with olive oil, then massage with your hands until it softens, achieving a salad consistency. Take the peel off the eggplant and discard. Separate out the inside and break it apart into chunks with a fork. 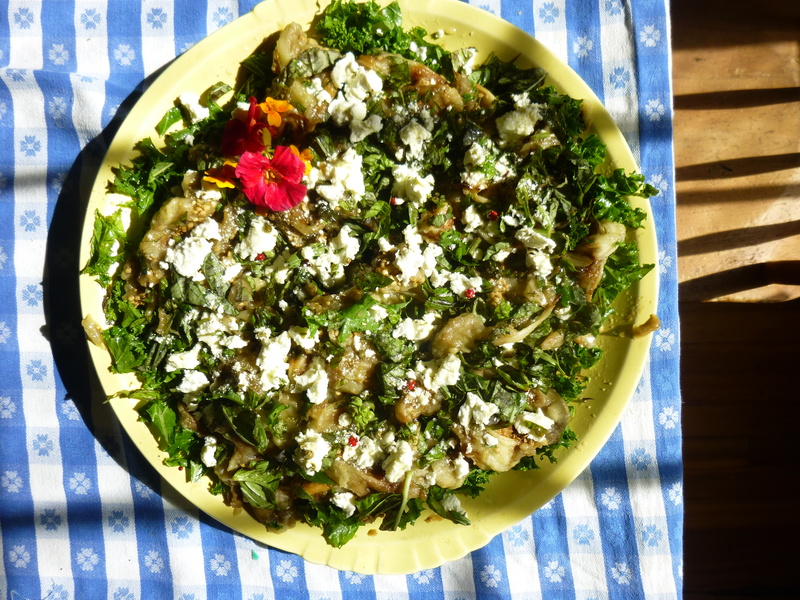 Place the kale on a large platter, and top with eggplant, then basil. Drizzle with balsamic, then crumble goat cheese and olive oil on top. Peppercorns (in my goat cheese) are a good plus too, for aesthetic and flavor piquancy. I made this for a potluck and was having difficulty not stuffing my face before leaving. Easy to eat an abundance. It looks pretty, and I love taking pictures of my food. Just don’t forget to enjoy the company, place, and time of your food as well (a beautiful article, written by a college friend of mine). Yes, Isabel, I have been enjoying potato salad of late. There was a time when I hated potato salad, but I kept trying it again, and finally had to remind my dear friend Isabel to tell me not to eat it. Not the case now, I have met a number of potato salads that I rather like (one in particular that is closer to classic than this, but with raw fennel and a light creamy herby dressing. One for another time). 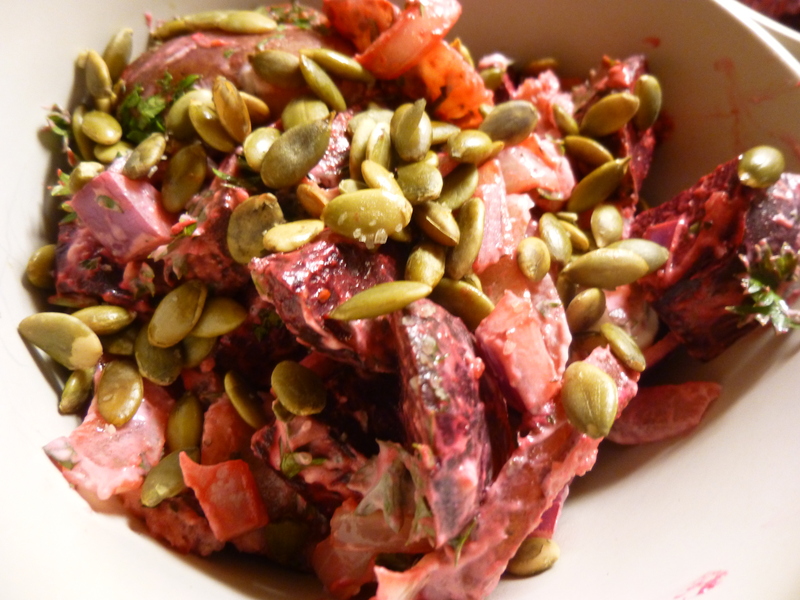 “Let’s cook beets” turned into dinner here through a little cream cheese, a few extra herbs, and some toasted pumpkin seeds. Not bad for an open-the-fridge-and-see-what-we-find meal. Sour cream would also be acceptable. Additionally, I am planning a trip to Germany at the end of November. I imagine I shall be taking a two-week hiatus from Dancing Tree as well, but promise to have plentiful food photos from my travels! Roast the beets first. This may take a while, and can be done in advance. Chop, put in a pan with some oil, and roast at 350-400º for at least 30 minutes. Roast the potatoes the same way, although I recommend a separate pan if you can swing it, since beets have a little more water and it’s nice to let the potatoes get a bit crisp. Once they are soft (stab them with a fork or knife to determine pliability), remove from the oven and let cool. Meanwhile, chop up the red onion and other herbs. Place the onion in a large bowl and add the semi-warm beets and potatoes; mix. This will take the bite off the onion just enough to add a little kick without being overwhelming. Mix in the cream cheese, allowing it to melt a little in the warmth, and then the rest of the herbs. Taste and salt and pepper as needed. Top with toasted pumpkin seeds, and enjoy with a side of toast (not required but recommended). There is something quite magical about a fresh ripe tomato. Sweet, acidic, juicy, and maybe umami (which I admittedly don’t quite fully understand yet, but tomatoes have it). Occasionally I find dishes missing a certain satisfaction; adding a tomato frequently fills that void. There’s all sorts of interesting science cropping up in the news lately about grocery store tomatoes, from ripening them in a hot bath before chilling them to developing hardy tomatoes with Actual Flavor (what a concept!). But, I would much rather eat heirloom tomatoes, despite their long and convoluted history. Plus, I can grow those in my own garden (! ), collect them from friends when they are perfect, and freeze the ones I can’t use for winter soups and sauces. Currently, however, it is still summer (yes, I realize it’s September), and I want to be eating fresh tomatoes. But I also want sauce. Something to slurp up with pasta and absorb that rich tomato flavor, but keep some of the freshness. Friends, there is a solution. It happens to reduce prepwork too, as long as you don’t mind skins and seeds (helpful when you still want to be swimming all day). By flash cooking the tomatoes, you get them to release their juices; then strain out the chunks and put them aside; boil down the juice to get the thick, deep, orangey essence of tomato. Stir back in your barely cooked tomatoes and you are good to go (there’s garlic in there somewhere too). I would use your medium-grade tomatoes for this. The fresh fresh perfect ones you eat on the spot. The rough and tumbley ones you blanch, peel, and make into freezer sauce or can (or, just freeze whole and when you take them out and start heating them, the skins slip right off). Somewhere in the middle are fresh sauce tomatoes, that require minimal processing but still aren’t quite perfect—maybe a little too soft on some sections, or unevenly ripened. From this you distill your essence. Mince garlic; large-ish chunks are fine. Heat oil in a large saucepan over high heat until slightly shimmery, then add garlic and fry briefly, watching carefully so it doesn’t burn. Meanwhile (or ahead of time if you want to make sure to have a proper mise en place), chop the tomatoes into large chunks, removing any areas that are extremely soft, and large cores. 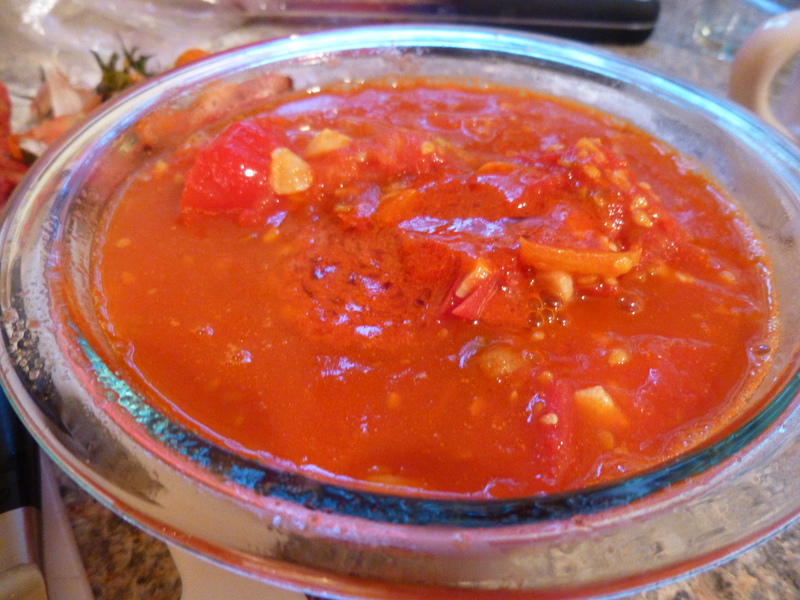 When garlic is slightly golden, add your tomato chunks and stew for a very brief minute or two, just enough time for the tomatoes to release most of their juices. With a slotted spoon or a strainer, or most likely a combination of the two, remove the tomato pieces and place in a strainer over a bowl, to catch the rest of the juices. You will probably end up collecting most of the garlic chunks too, that’s good, since you don’t want them to boil too much (although any that you miss won’t be a problem). On high, boil the tomato juice until you run out of patience, or it gets very thick; add in any additional juice from the draining tomatoes every so often. When thick, turn off the heat, and add back in the tomato chunks. Stir, and serve. I recommend a few torn basil leaves, and a little cheese if you feel so inclined. Excellent, of course, with pasta, or on toast, or just eaten by the spoonful. It’d be worth making fresh pasta for this—once you have one fresh component, may as well go for the whole meal, right? Okay, I know this is a little out there for some: every once in a while you get a craving for a nice creamy vegan rice bowl. 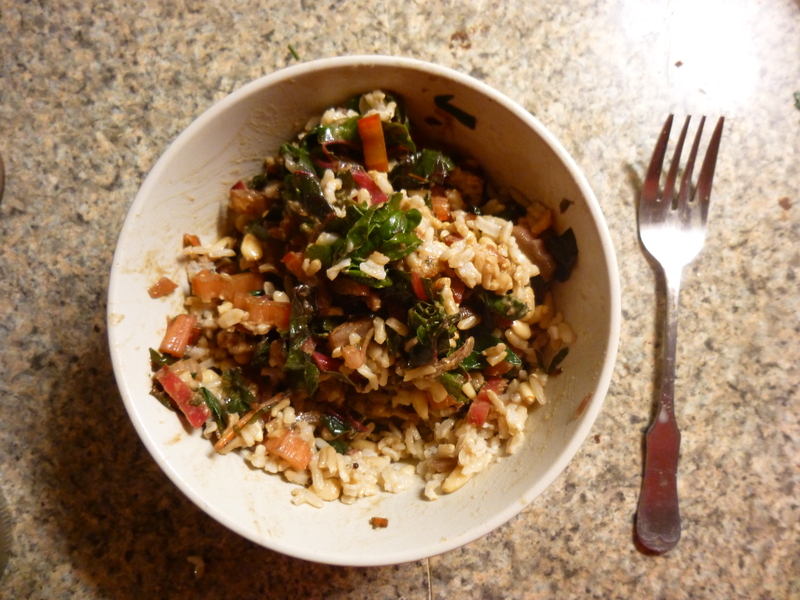 Lots of almost bitter tahini dressing, a bunch of dark leafy greens, probably some seeds and a heaping of flavorful brown rice. It’s the kind of thing you find at a place like Life Alive in Cambridge. They’re right, it’s the kind of food that makes you feel great after eating it. And during, too. I find that the more veggie-based meals I eat the more I want them,—I’m establishing a craving. Try it at least once, and I suspect you’ll return. Besides which, it’s very easy and comes together quickly for a good weeknight meal. You may be eating this alone, as one does when living alone (or when living with others, for that matter) during the week (more people these days are dining alone, apparently). This is not such a problem, however, as long as you take the right approach. Decide not to have dinner alone, but to eat with yourself, and enjoy your own company. Alone time is important. Start with the rice. I highly recommend cooking it with coconut milk (adds an extra depth); cook as usual (cover with a half inch or so of water, bring to a boil, then simmer until cooked). Add more hot water if necessary to prevent burning. Chop the chard and sauté with a little olive oil. When almost cooked (it will go fairly quickly; although kale takes a little longer to get soft), stir in some apple cider vinegar. Make the dressing: Stir a big spoonful of tahini in with a little vinegar and some more oil, if desired. Add finely minced garlic and ginger (doesn’t need much) if you like as well. I recommend mixing in a jar and then putting on a lid and shaking it up. Taste, add salt and pepper and any other seasonings you like. 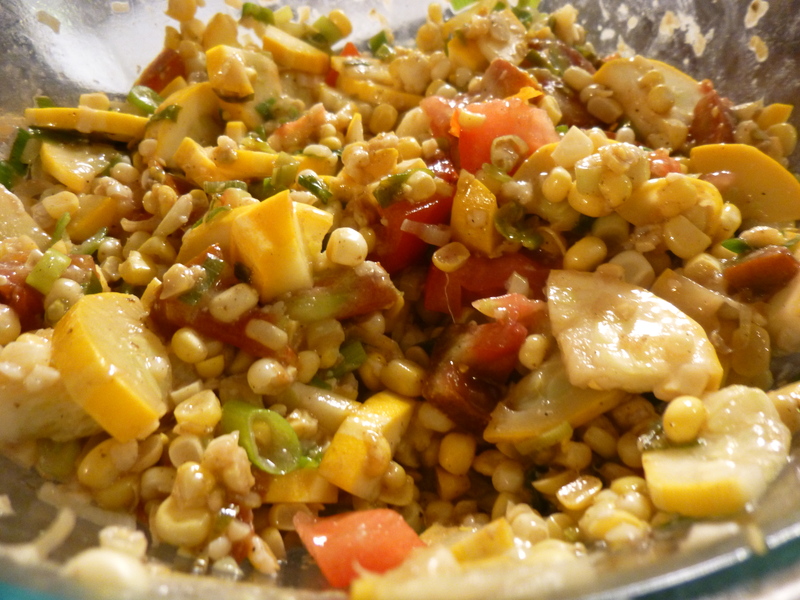 Rice-chard-seeds-dressing. Mix, taste, adjust, garnish with fresh herbs, lemon, and/or tomatoes if you have any lying around. Dive in, and be happy. It’s good with tofu too, other vinegars, coconut flakes, avocado, other veggies… and you can add cheese or stir in a little yogurt if you like too. P.S. I would like to very much thank Edibletcetera for nominating me for Leibster award! I’ll get to it this week, promise. Corn! How exciting. And so many ways to eat it. Raw on the cob, raw off the cob, roasted, grilled, in a tart or pancakes… or in salsa. Or a salad. I’m calling it a salsa salad because it could be either. I was happy eating it as a meal but it would also make a good potluck dish or topping for tacos or in a burrito. It takes approximately five minutes to throw together so you’re in luck if you’re running late to a party or to your empty stomach. Corn gets a lot of flak (which, by the way, is different from flack, a person who deflects criticism. Although someone receiving a lot of flak might need a flack) in the media these days for being one of the single crops causing America’s obesity epidemic, either in the form of syrup in everything, as animal feed contributing to suffering, or because it’s often a GMO. There was a fascinating piece about corn wars with China in the New Republic the other day, reflecting the importance of research money, the power of corporations, and the grandness and challenge of trying to feed a political world. You may also be interested in “How corn made its way into just about everything we eat” from the Washington Post. Or checking out the picture in Vox about the evolution of corn (and other crops). Humans are good at making things work for us. Corn also plays a significant role in sustainable ag of the future, especially where it was native and there are still people to uphold its traditional uses and growth patterns. Most notorious corn is not that which we eat, but whatever is grown for animal feed or biofuel. Sweet corn, the kind we’re used to consuming, is not a large part of the corn production in the U.S. It is instead a happy contribution to summer, and perhaps to your next meal. Shuck the corn, and cut the kernels from the ears. Chop up the scallions and the zucchini. Heat up a little oil in a pan over high heat, then add the scallions, zucchini, and corn. Stir frequently until soft, squeezing in a little lime halfway through; the corn should get toasty in the high heat and the scallions will wilt. Chop up the tomato (and pepper if using) in the meantime, and grate the cheddar. Put the corn in a bowl with more lime, the hot sauce/pepper, and the chopped tomato, then add the cheddar and mix it all up. Toss with a little salt too, to taste. Serve over rice, with beans if you like; an avocado would also definitely not be amiss. Good hot or room temperature, but best eaten fresh.